Agencies can access all of their client accounts under one login and easily transition between them. They can also provide their clients a variety of user access levels so that they can view reporting and leverage different features within the account. With a number of options to manage client billing and usage, agencies can choose to pay for clients directly, have the client pay for it, or set marked-up rates and manage payment through our Stripe integration. 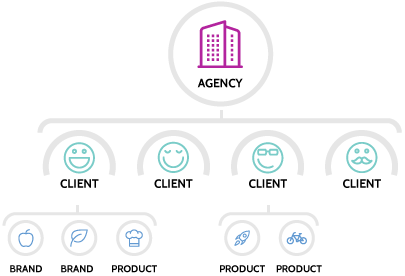 Our Marketing plan provides different options to white label our platform and make it consistent with your agency branding. You can choose to white label on our domain or yours. Included in the white label is the customization of reports, email alerts, and help pages. Give your agency and your customers the tools they need to always stay on top of their campaign performance. See how campaigns are performing at a macro level across all clients. Our real-time agency dashboard shows agency call volume, cost, revenue, and campaign performance so that they can quickly spot issues and drill down by client view. Send call data into top marketing and analytics platforms through integrations with Google Analytics, Adwords, Salesforce, Marketo, HubSpot, and more. Customize agency call tracking reporting to be consistent with your agency's communication cadence and the preferences of your customers. Provide the level of detail that your clients need to understand the performance of their campaigns. You control the frequency, the content, the recipients, and white label the look and feel of the reports with your own branding. Real-time call reporting give clients critical information about how their calls are being handled through features like call recording, live listen, scoring, and conversion tracking. Our keyword spotting engine can automatically sends alerts and tag calls for reporting. Our FormReactor® and text messaging services allow them to streamline and automate those communication flows. Prefer to take a hands-off approach and be an affiliate? Become a CallTrackingMetrics affiliate and get a link that is yours to share. Everyone who signs up using your link will earn you 10% of what they pay CallTrackingMetrics across the lifetime of their account. Apply to become a CallTrackingMetrics affiliate so you can start promoting our services to your clients. Start promoting CallTrackingMetrics using your affiliate link and use our selling tools to help your conversations. Your referrals sign up for CallTrackingMetrics accounts and spend money on the services. You earn 10% of everything they spend across the lifetime of their account. You get paid every month via PayPal.